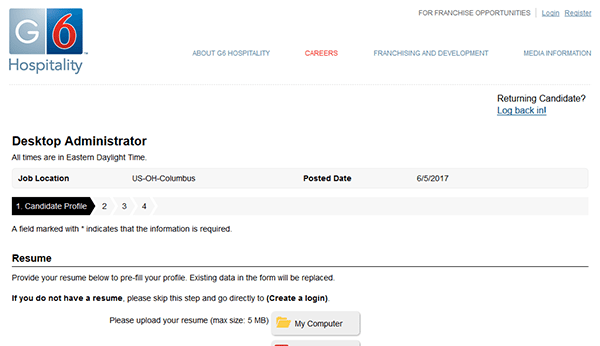 Learn how to search for current job openings and fill out the Motel 6 job application in the how-to guide posted below. Several different types of careers can be searched/applied for on the company’s main careers page including corporate, operations, and support positions. Learn more about how to apply for current openings by reading the below section. About the Company: Motel 6 is an American chain of motels based out of Carrollton, Texas. The company was founded in 1962, and currently has numerous location throughout both the United States as well as Canada. Motel 6 is owned/operated by the Blackstone Group (via G6 Hospitality). 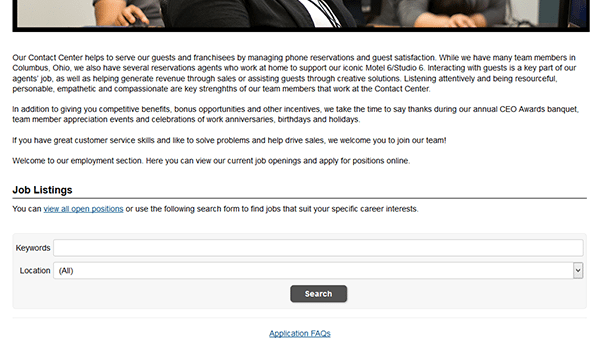 Step 1 – Click this link to open the Motel 6 main employment page in a new browser window or tab. Step 2 – Once on the main careers page, scroll down and then click the link of the specific type of job that you want to apply for (e.g. corporate, contact center, operations leaders, property team). Step 3 – Search the list of current openings by entering a keyword into the input field or selecting a location from the drop-down list. Step 4 – Press the title of the position that you want to start the online application process for. Step 5 – Review the full description of the job and then click the button as shown in the below screenshot. Step 6 – Select how you want to create your online profile. Step 9 – After each step/section of the form has been completed you will be able to submit the form for processing.